Artificial intelligence has the potential to make huge improvements in just about every aspect of healthcare. 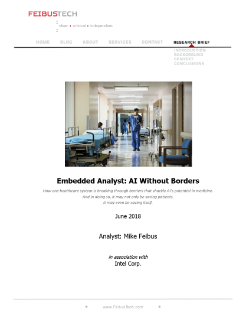 Learn how Montefiore Health Systems is using semantic data lakes, architectures, and triplestores to power AI patient-centered learning. One healthcare system has been pioneering efforts to free researchers from these constraints. With origins in post-9/11 municipal emergency projects, ...Montefiore Health Systems platform – called PALM, short for patient-centered Analytical Learning Machine - is beginning to prove itself out in the Intensive Care Unit, helping doctors save lives by flagging patients headed toward respiratory failure.